You will earn 14 WayPoints for each product that you purchase. The Mono Frog Juicer automatically and instantly switches the polarity of a single frog as the engine passes over the turnout. No more complicated wiring or electro-mechanical switches are needed. Instead you simply connect power to the Frog Juicer and a single wire to the frog. The Frog Juicer takes care of the rest! The New Universal Mono Frog Juicer works with all DCC systems, including NCE PowerCab! Need to switch multiple frogs? 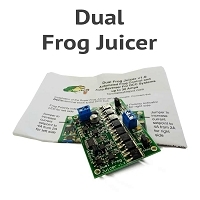 Check out the Universal Dual Frog Juicer or Universal Hex Frog Juicer! Mono Frog Juicers automatically control the polarity of a single isolated frog in DCC powered trackwork. These units are ideal for automating single turnouts and wyes. Multiple units can be used to automate pieces of trackwork with multiple isolated frogs such as double slips switches, three ways, double crossovers and crossings. 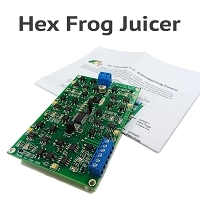 An economical alternative to using a Hex Frog Juicer if only a single frog needs to be controlled. Can be installed close to the trackwork being controlled - no need for long feeders. 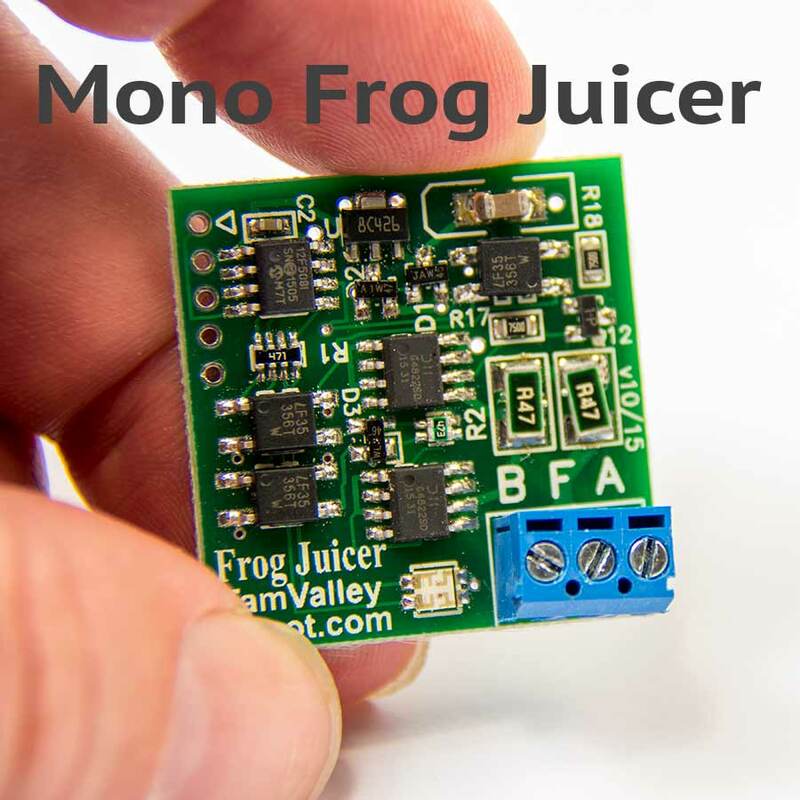 If you have ever struggled with wiring up the frogs on a switch, then you will want to seriously consider using the Mono Frog Juicer. It is simple to use, and just plain works. 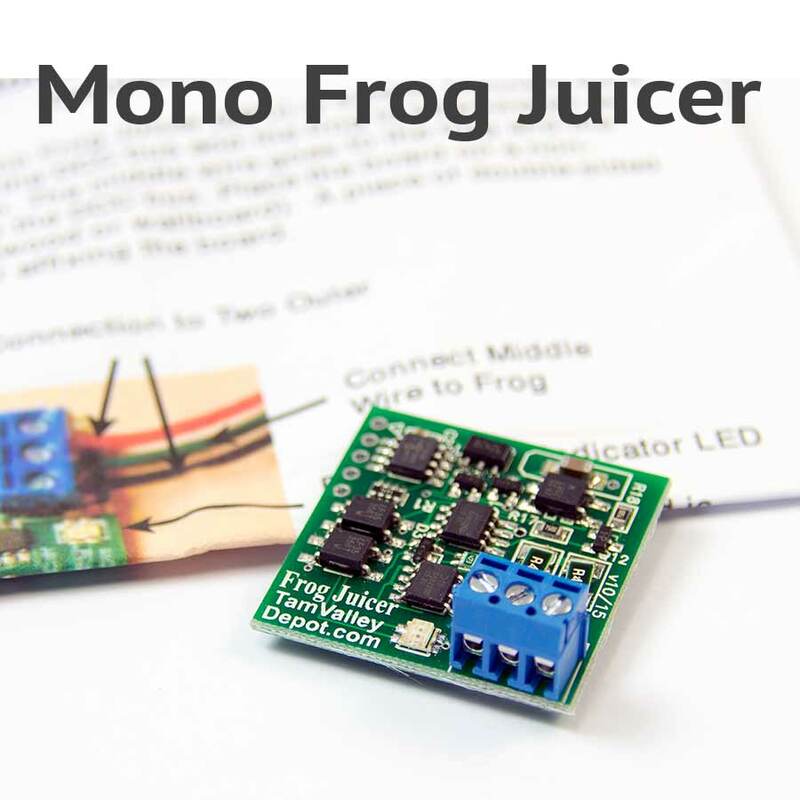 The Mono Frog Juicer consists of a microprocessor controlled SPDT electronic switch. 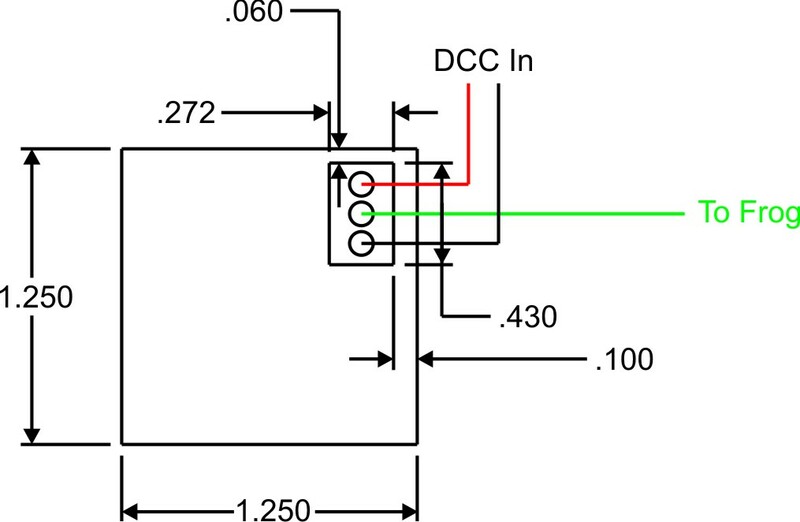 This switch can sense and control the polarity of an isolated DCC controlled frog. When the circuit detects a short greater than about 1.7 amps (plus/minus 10% with 2 amps the upper limit), it instantly switches the polarity of the frog. 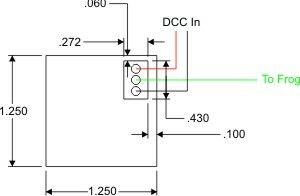 Two amps is below the reverse polarity detection point for most DCC circuit breakers and booster units so that the Frog Juicer will react before a fault is detected. In addition, the Frog Juicer switches so quickly that the brief current pulse will go unnoticed by the DCC system. Two amps is also enough current to power a single locomotive, and since only one locomotive can be on a frog at a time it is all the power that you need. The frog needs to be electrically isolated and have no other connections to the track or DCC system. A reduced overall rating here due to a Canadian business that doesn't have an option to show pricing in Canadian currency. Very disappointed in that. Beyond that though great service from order placement to delivery and appreciate the step by step update of the order status. Don't know if Frog J is faster than a circuit breaker or trips at a lower current or both... but so far, works just fine on the down stream side of the CB. Good job guys. I find these little Frog Juicers quite handy! Seeing as I have crammed over 30 turnouts and half a dozen crossings on a 4X8 layout (modeling NYC industrial lines/LIRR), these Frog Juicers save a LOT of wiring because they can be situated close to the turnouts (or wherever convenient, such as on/under a control panel) and power can come from the nearest feeders. They have proven reliable and whether a single juicer or a hex juicer, they will make life a LOT easier if you don't fancy sending more than two wires to each switch machine!